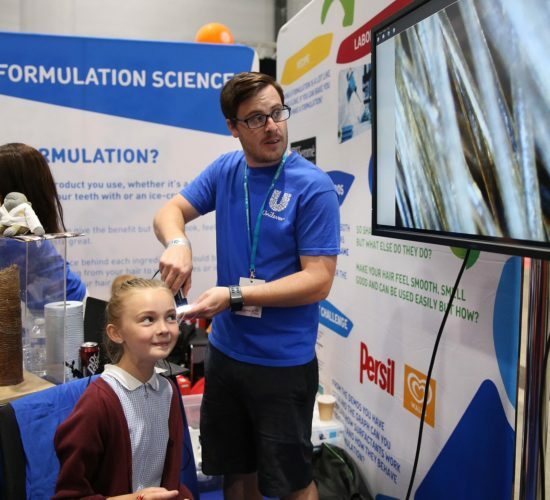 The Big Bang North West 2018 was another HUGE success for All About STEM as a team and for All About STEM Events, an additional branch of our ever-expanding empire. But did you know that we are also all about design? 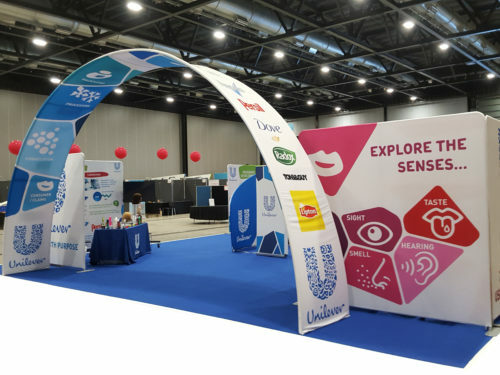 At this year’s Big Bang North West we showcased our new design, print & brand services by creating an amazing new exhibition stand for our Diamond Sponsor, Unilever. From initial design to event ready in 17 days! 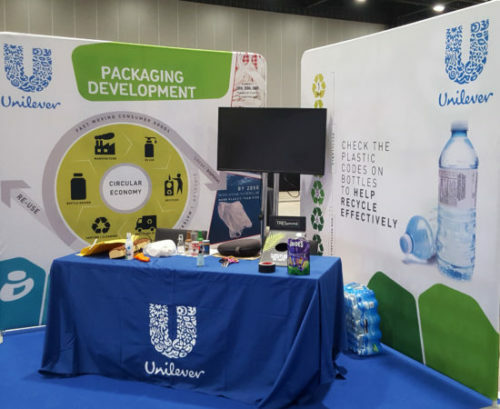 We were approached by Unilever to help them deliver an exhibition solution in a relatively small timeframe. 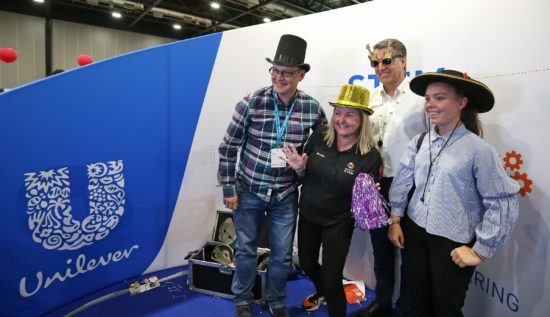 Luckily we have our own in-house graphic designer, Kev, who has many years of experience in designing, sourcing and liaising the right suppliers for every print and exhibition job! 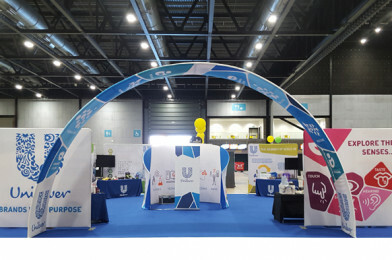 As Unilever had very few assets available in this short timeframe, we needed to source all of their stock photography and transfer the information required using their brand guidelines onto 8 double sided fabric display stands, a 2 meter by 3 meter fabric pod and a dramatic 6 meter wide by 4 meter high fabric archway to help create Unilever’s vision. 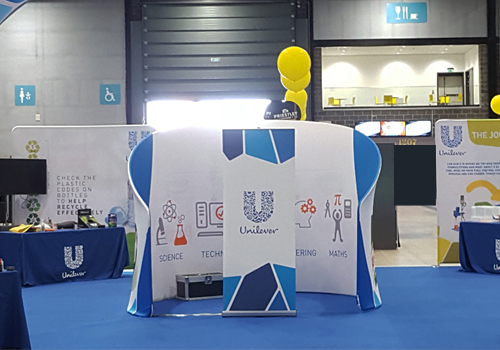 As you can see, our Big Bang North West attendees loved the new Unilever stand… and so did the Metro Mayor! If you would like to know more about our design, print & brand services, get in touch! 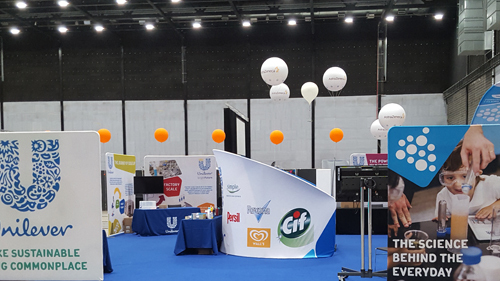 Business printing, brochures, pop-ups, posters, exhibition elements, large formats, promotional materials and much, much more.